Alexander Thomson of Banchory House (1792-1868) was a man of his time. A country gentleman with a thirst for knowledge and a determination to improve the world around him. His numerous interests included Natural Science and Natural Philosophy, geology and agriculture, Scottish history and classical antiquity, penal and educational reform, and the sanitary conditions of the Poor. He was a man of religion and a man of science, who revered his Queen and had much in common with the Prince Consort. His home was filled with books and the curious objects which reflected his travels and opinions. 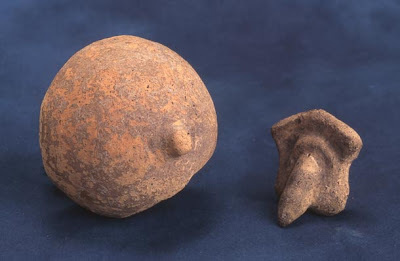 "The photograph shows two fired clay votive offerings, this one being a model of a female breast. They date from the Roman period, probably 2nd century BC to 1st century AD, and were collected by Alexander Thomson as part of a collection of pagan and Christian, 'popish' votive offerings which he made in 1863 while in Rome. Similar pre-Christian, clay votive offerings of other parts of the body, such as one of the eye, which is is Thomson's collection, were also made. The 'popish' votive offerings also show parts of the body, and are made in pressed metal. As a Protestant and a participant in the Disruption, Thomson was anxious, in his display in Banchory House Museum, to show the two types of offering together, to illustrate the similarities in thought and belief between those of the pre-Christian pagans and those of the Roman Catholics"